Description: Top of the line power leads H 88 toward Binghamton. The BNSF unit was not the typical power on this train, though there were several units that stayed on this job for several months that year. Description: H 88 behind top of the line power arrives at Binghamton, crossing the Chenango River as it approaches QD. Description: H 88 with a BNSF leader passes the detector at MP 223.2 on track 2. In the background at right is one of the many Endicott Johnson buildings that were once part of an extensive shoe making operation, that is now only a memory. Description: H 88 has opened up at QD, and is now going up into the yard to drop its 22 cars. Description: Westbound on track one with a series of SD70Ms. Description: Damned dirty for something new. 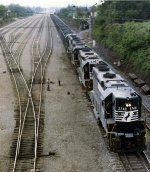 Description: a NS auto train heads west out of the mixing center. Description: This photo seems to have blotches in the way. That is because this photo was taken through the window in the Amtrak platform overpass. Description: 204 breaks the stillness of a Saturday morning. Gotta love the classic car waiting at the grade crossing. Description: A Norfolk Southern SD70M-2 awaiting a signal at CP Green. Description: Running through the tunnel in an NS SD70M-2. Description: The intermodal (foreground) is headed downslope (eastbound). The locomotives and trailers (background) are pulling upslope (westbound) toward the summit at Gallitzin. Description: Drifting eb into Abrams Yard by the Valley Forge Park station at Port Kennedy. Description: Two EMD six axle units awaiting a crew at E-Rail. Description: Northbound passing former PRR Passenger station in city in a rain storm.